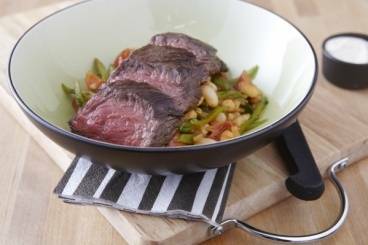 A warm bean salad spiced with smoked paprika, served with a chargrilled rump steak and mustard flavoured yogurt. Season the rump steak with salt, pepper and some sunflower oil. Cook on the grill for 3 minutes each side. Cut the cherry tomatoes into half. Dice the onion and garlic. Pick the leaves from the parsley and roughly chop. Heat a frying pan and add a splash of olive oil. Sweat the onions with a pinch of salt until soft and translucent. Add the chopped garlic and cook for a further minute. Add the herbs and spices and cook for a minute. Add the tomato vinegar, reduce to a syrup and then add the mange tout. Cook the mange tout for a couple of minutes with a splash of water and when they are cooked add the tomatoes and tinned beans. Finish with the chopped parsley and check the seasoning. For the yogurt: Mix the yogurt with the mustard and season with fine salt. Place some bean salad in the middle of the plate. Slice the steak into 5 pieces on an angle and serve on top. Finish with a spoonful of the mustard yogurt.